How to drive your car up (and down!) 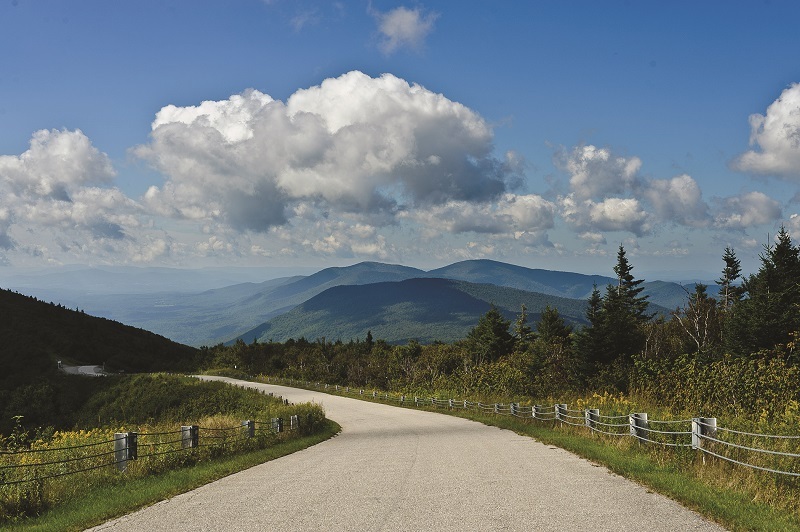 Vermont’s famous Skyline Drive. There is only one Skyline Drive in Vermont and it begins at VT Route 7A just 5 minutes south of Manchester Village. Round-trip, the journey to the top of Equinox Mountain and back is 10.5 miles. Easy peasy, you say? Well, yes… and no. 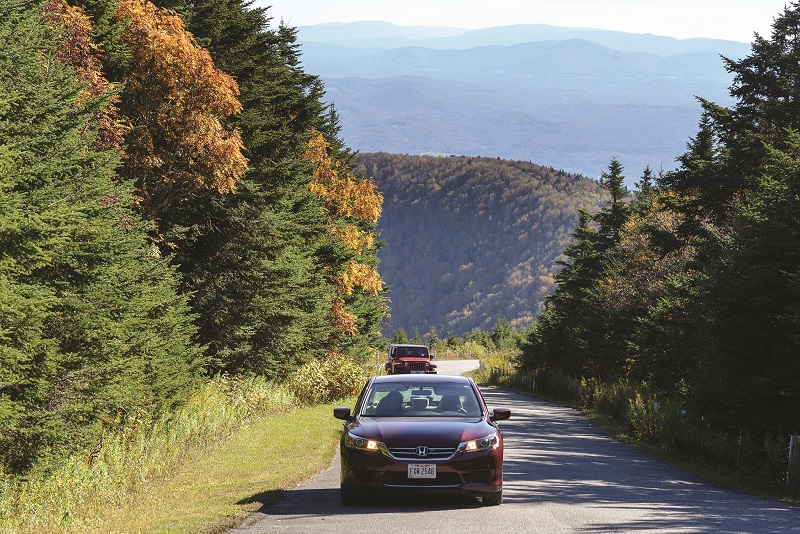 The toll road takes you to the highest peak in the entire Taconic Mountain range, so at the top, you and your car will be nearly 4,000 feet above sea level, taking in some of America’s most unforgettable views. But have you thought about this: Is climbing the mountain more difficult on your vehicle? Or is it worse cruising down again? “It’s like a runner getting ready for a marathon. You don’t just show up and run. So, be sure your car is ready for the climb and descent by checking your tires, oil, and transmission and brake systems,” says Russ Bauer of Langway Chevrolet Volkswagen of Manchester. Russ worked as a technician and service manager before becoming the general manager, and he has driven up the Skyline Drive enough to know what that road does to cars. He says, “Going up is easier on your car. Coming down, use your low gear and brakes about 50/50 to prevent brake fade. If your brakes overheat, your stopping power declines.” His best tip is to keep one eye on your gauges, but to also enjoy the scenery. The best place to stop and rest both your transmission and brakes along the way, as well as to perhaps steady your nerves, is a scenic turnout called “the saddle.” It’s quite thrilling that the skinny ridge you are on at that spot is only as wide as the pavement and not an inch more. Like the feeling you get on a roller coaster the moment it drops, the terra firma on both sides dramatically falls away into the broad valleys far below. Now for some street smarts! Considering there are 41 turns on the Skyline Drive, and that half of those are heart-pounding hairpins, and that only one short section of the climb offers a slight dip, you would want the driver of your car to know that it’s not a good idea to hug the center line at any time—heading up or down. Just a little high-altitude courtesy to remember: any vehicle climbing the mountain should be given the right-of- way to maneuver as needed. This is because the drivers going downhill can steer their cars with more control and safety in case they must back up. But, fear not—this roadway is safe. It is well maintained and clearly marked, and there are big, beautiful guardrails. • Pay your fee inside the Toll House before driving up to the entrance gate. • Check the weather forecast beforehand, but be aware that even a nice summer’s day downtown can change in an instant to fog and clouds on the mountain’s peak. • Be prepared for at least 10 degrees cooler temperatures at the top, and somewhat higher wind speeds, too. • Drive up early and stay until the mountain closes at 4pm. • Pets on leashes are welcome, except inside the visitors center at the summit. Is there anything to do up on top? • Visit the exhibitions at St. Bruno Visitors Center. Inside, you will learn about the Carthusian monks living on the mountain, read about Dr. Joseph Davidson who owned the mountain at one time, and find out about the mountain’s flora and fauna. • Walk the 0.2-mile trail to Lookout Rock. Pick up a trail map at the Toll House before you start. • Picnic! There are picnic tables indoors and outdoors for those who pack their lunches ahead of time. • Check out the informational panels highlighting the places you can see from the summit. A. You can see Canada from the summit of Equinox Mountain. B. Monks own the entire Skyline Drive. C. Tour buses, RVs, and camper trailers cannot drive on the toll road. A. On a clear day, you can see forever, including the peak of Mont Royal in Canada. You can also see the Green Mountains (east), the White Mountains (farther east), the Adirondacks (west), and the Berkshires (south). B. Now the longest privately owned, paved toll road in the United States, the mountain and the road were a gift to the Roman Catholic Carthusian monks from Dr. Joseph George Davidson, former president and chairman of Union Carbide. He was also a prolific inventor. In 1960, he had built a modern house about one-third of the way up the mountain, where he lived until his death nine years later. C. The Skyline Drive and the summit are reserved for the enjoyment of drivers and passengers in automobiles and on motorcycles.